Beautiful Oceanfront Condo with Spectacular Ocean views from every room. Completely renovated and fully furnished 1 bedroom 1.5 bath unit. Enjoy the sunrise, warm ocean breezes and spectacular views in the shade of your private balcony. Lots of wildlife including dolphins, turtles, pelicans, gulls, rabbits and more. Just minutes away from the historic old town district of St. Augustine. Restaurants within walking distance, shopping and entertainment nearby. Play Golf at the World Golf Village. My Husband and I had The Best Relax Vacation in Greg & Carol Condo. Their Hospitality was IMPECCABLE! The View from the balcony is breathtaking. This place was everything we were looking for, quite, peacful and private! The Beach was perfect! The place is full with everything needed. We will be back! LOVE the Condo and the Privacy! Perfect location. Incredibly decorated and furnished. Absolutely perfect for couples only. Made our 10 day vacation one to remember for a long time. Quiet, clean, modern beach retreat well worth the trip. When I shop online for places to stay I always have this small doubt in my mind: will it be as good as advertised or is there a secret catch? The surprise here is it’s better than it looks. This beautiful, cozy, and clean condo is both modern and comfortable. The owners were very easy to communicate with and the check in and out process totally convenient. The unit overlooks the dunes right onto the beach. The beach itself is great for families looking for tide pools and easy walks as well a little body surfing. My wife and I stayed here and had the most relaxing trip in quite some time. The bed is large and soft, the chairs and couch inviting for that afternoon nap, and the kitchen well stocked with cooking essentials. The walk in closet is a plus. The owners have really thought about making your trip as pleasant as possible. It is an upstairs unit with stairs from the parking lot for those with mobility issues. No problem at all for those without issues. We will be back as soon as possible! If you’re looking for a quiet, relaxing getaway—this is the place! 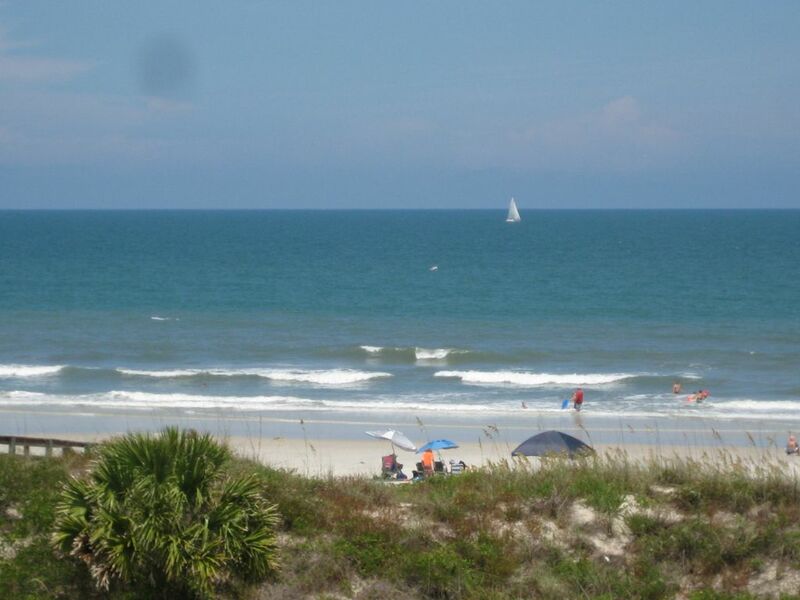 Beautiful views, stocked kitchen, beach chairs/towels/umbrella/small cooler are already there ready to use. it’s definitely important to note the stairs, and the dryer does take a long time to dry the load—but a few flights of stairs gets ya movin’ and a long dry time is better than not having a dryer at all! :) LOVED IT! Everything we could have hoped for. The place was clean and decorated nicely with beach-y things. We could see and hear the waves from the balcony and it was short walk to the beach. Key access was easy and the hosts were helpful. Thank you! Beautiful modern condo right on the ocean. Has everything you need. Quiet, relaxing and comfortable. Prices based from Saturday to Saturday. Rates are subject to change.